George Washington's farewell address is a letter written by President George Washington as a valedictory to "friends and fellow-citizens" after 20 years of public service to the United States. He wrote it near the end of his second term of presidency before retiring to his home at Mount Vernon in Virginia. The letter was first published as The Address of Gen. Washington to the People of America on His Declining the Presidency of the United States in the American Daily Advertiser on September 19, 1796, about ten weeks before the presidential electors cast their votes in the 1796 election. It is a classic statement of republicanism, warning Americans of the political dangers which they must avoid if they are to remain true to their values. It was almost immediately reprinted in newspapers throughout the country, and later in pamphlet form. The first draft was originally prepared by James Madison in June 1792, as Washington contemplated retiring at the end of his first term in office. 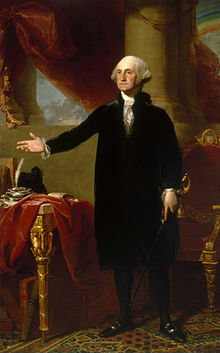 However, he set it aside and ran for a second term because of heated disputes between Secretary of the Treasury Alexander Hamilton and Secretary of State Thomas Jefferson which convinced Washington that the growing tensions would rip apart the country without his leadership. This included the state of foreign affairs, and divisions between the newly formed Federalist and Democratic-Republican parties. The thought of the United States without George Washington as its president caused concern among many Americans. Thomas Jefferson disagreed with many of the president's policies and later led the Democratic-Republicans in opposition to many Federalist policies, but he joined his political rival Alexander Hamilton—the leader of the Federalists—in convincing the president to delay his retirement and serve a second term. The two men feared that the nation would be torn apart without his leadership. Washington most likely referred to this when he told the American people that he had wanted to retire before the last election, but he was convinced by people who were, in his words, "entitled to my confidence" that it was his duty to serve a second term. All of the ideas presented in Washington's Farewell Address came from Washington; however, Alexander Hamilton wrote most of it. Washington goes on to warn the American people to question the ulterior motives of any person or group who argues that the land within the borders of the United States is too large to be ruled as a republic, an argument made by many during the debate on the proposed purchase of the Louisiana Territory, calling on the people to give the experiment of a large republic a chance to work before deciding that it cannot be done. He then offers strong warnings on the dangers of sectionalism, arguing that the true motives of a sectionalist are to create distrust or rivalries between regions and people to gain power and take control of the government. Washington points to two treaties acquired by his administration, the Jay Treaty and Pinckney's Treaty, which established the borders of the United States' western territories between Spanish Mexico and British Canada, and secured the rights of western farmers to ship goods along the Mississippi River to New Orleans. He holds up these treaties as proof that the eastern states along the Atlantic Coast and the federal government are looking out for the welfare of all the American people and can win fair treatment from foreign countries as a united nation. Washington goes on to state his support for the new constitutional government, calling it an improvement upon the nation's original attempt in the Articles of Confederation. He reminds the people that it is the right of the people to alter the government to meet their needs, but it should only be done through constitutional amendments. He reinforces this belief by arguing that violent takeovers of the government should be avoided at all costs, and that it is the duty of every member of the republic to follow the constitution and to submit to the laws of the government until it is constitutionally amended by the majority of the American people. Washington continues to advance his idea of the dangers of sectionalism and expands his warning to include the dangers of political parties to the country as a whole. These warnings are given in the context of the recent rise of two opposing parties within the government—the Democratic-Republican Party led by Jefferson, and Hamilton's Federalist Party. Washington had striven to remain neutral during a conflict between Britain and France brought about by the French Revolution, while the Democratic-Republicans had made efforts to align with France and the Federalists had made efforts to ally with Great Britain. Washington continues his defense of the Constitution by stating that the system of checks and balances and separation of powers within it are important means of preventing a single person or group from seizing control of the country. He advises the American people that, if they believe that it is necessary to modify the powers granted to the government through the Constitution, it should be done through constitutional amendments instead of through force. Washington provides strong support for a balanced federal budget, arguing that the nation's credit is an important source of strength and security. He urges the American people to preserve the national credit by avoiding war, avoiding unnecessary borrowing, and paying off any national debt accumulated in times of war as quickly as possible in times of peace so that future generations do not have to take on the financial burdens that others have taken on themselves. Despite his warnings to avoid taking on debt, Washington does state his belief that sometimes it is necessary to spend money to prevent dangers or wars that will in the end cost more if not properly prepared for. At these times, he argues, it is necessary for the people to cooperate by paying taxes created to cover these precautionary expenses. He emphasizes how important it is for the government to be careful in choosing the items that will be taxed, but also reminds the American people that, no matter how hard the government tries, there will never be a tax which is not inconvenient, unpleasant, or seemingly an insult to those who must pay it. Washington dedicates a large part of his farewell address to discussing foreign relations and the dangers of permanent alliances between the United States and foreign nations, which he views as foreign entanglements. This issue dominated national politics during the French Revolutionary Wars between France and Britain. Federalists favored Britain and the Jeffersonian Republicans favored France. The Republicans wanted the U.S. to honor the 1778 Treaty of Alliance and to aid France, while the Federalists favored an alliance with Britain. Washington had avoided American involvement in the conflict by issuing the Proclamation of Neutrality, which in turn led to the Neutrality Act of 1794. He tries to further explain his approach to foreign policy and alliances in this portion of the address. Washington advocates a policy of good faith and justice towards all nations, again making reference to proper behavior based upon religious doctrine and morality. He urges the American people to avoid long-term friendly relations or rivalries with any nation, arguing that attachments with or animosity toward other nations will only cloud the government's judgment in its foreign policy. He argues that longstanding poor relations will only lead to unnecessary wars due to a tendency to blow minor offenses out of proportion when committed by nations viewed as enemies of the United States. He continues this argument by claiming that alliances are likely to draw the United States into wars which have no justification and no benefit to the country beyond simply defending the favored nation. Alliances, he warns, often lead to poor relations with nations who feel that they are not being treated as well as America's allies, and threaten to influence the American government into making decisions based upon the will of their allies instead of the will of the American people. Washington makes an extended reference to the dangers of foreign nations who will seek to influence the American people and government; nations who may be considered friendly as well as nations considered enemies will equally try to influence the government to do their will. "Real patriots", he warns, who "resist the intrigues" of foreign nations may find themselves "suspected and odious" in the eyes of others, yet he urges the people to stand firm against such influences all the same. He portrays those who attempt to further such foreign interests as becoming the "tools and dupes" of those nations, stealing the applause and praise of their country away from the "real patriots" while actually working to "surrender" American interests to foreign nations. Washington had experience with foreign interference in 1793 when French ambassador Edmond-Charles Genêt organized American demonstrations in support of France, funded soldiers to attack Spanish lands, and commissioned privateers to seize British ships. Genêt's mobilization of supporters to sway American opinion in favor of an alliance with France angered President Washington who ordered him to leave. Washington wraps up his foreign policy stance by advocating free trade with all nations, arguing that trade links should be established naturally and the role of the government should be limited to ensuring stable trade, defending the rights of American merchants, and any provisions necessary to ensure the conventional rules of trade. Washington later accepted a commission from President John Adams, despite his stated desire to retire from public service, as the Senior Officer of a Provisional Army formed to defend the nation against a possible invasion by French forces during the Quasi-War. 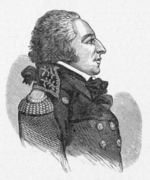 Washington held true to his statements in his farewell address, despite spending months organizing the Officer Corps of the Provisional Army, and declined suggestions that he return to public office in the presidential election of 1800. Washington's hope that the United States would end permanent alliances with foreign nations was realized in 1800 with the Convention of 1800, the Treaty of Mortefontaine which officially ended the 1778 Treaty of Alliance, in exchange for ending the Quasi-War and establishing most favored nation trade relations with Napoleonic France. In 1823, Washington's foreign policy goals were further realized in the Monroe Doctrine, which promised non-interference in European affairs so long as the nations of Europe did not seek to colonize or interfere with the newly independent Latin American nations of Central and South America. The United States did not enter into any permanent military alliances with foreign nations until the 1949 North Atlantic Treaty which formed NATO. Philadelphia residents signed a petition in January 1862 during the American Civil War requesting that Congress commemorate the 130th anniversary of Washington's birth by reading his Farewell Address "in one or the other of the Houses of Congress." It was first read in the House of Representatives in February 1862, and reading Washington's address became a tradition in both houses by 1899. The House of Representatives abandoned the practice in 1984, but the Senate continues the tradition. Washington's Birthday is observed by selecting a member of the Senate to read the address aloud on the Senate floor, alternating between political parties each year since 1896. Additionally, readers make an entry into a black, leather-bound journal maintained by the Secretary of the Senate upon finishing. According to political journalist John Avlon, the Farewell Address was "once celebrated as a civic Scripture, more widely reprinted than the Declaration of Independence" but adds that it "is now almost forgotten." 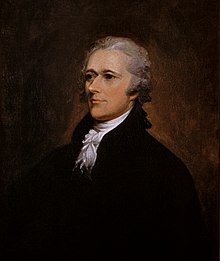 He suggested that it had long been "eclipsed in the national memory" until the Broadway musical Hamilton brought it back to popular awareness in the song "One Last Time", where lines are sung by Washington and Hamilton from the end of the Address. ^ a b c d e f Washington, George (September 17, 1796). Washington's Farewell Address – via Wikisource. ^ Robert W. Watson (2007). White House Studies Compendium. Nova Publishers. p. 319. ^ a b c "Religion and the Founding of the American Republic". Loc.gov. October 27, 2003. Retrieved September 19, 2009. This article incorporates public domain material from websites or documents of the Library of Congress. ^ "Washington's Farewell Address". University of Virginia, Charlottesville, Virginia: Papers of George Washington. Retrieved August 4, 2017. ^ a b c d e f Elkins, Stanley; McKitrick, Eric (1995). The Age of Federalism: The Early American Republic, 1788-1800. Oxford University Press. pp. 489–499. ISBN 978-0-19-509381-0. ^ a b c d e "Washington's Farewell Address, Senate Document No. 106–21, Washington, 2000" (PDF). Retrieved September 19, 2009. This article incorporates public domain material from websites or documents of the U.S. Government Publishing Office. ^ "George Washington's Farewell Address: Primary Documents of American History (Virtual Programs & Services, Library of Congress)". Library of Congress. September 6, 2017. Retrieved February 26, 2017. ^ a b "A Brief Biography of George Washington". Mountvernon.org. Archived from the original on August 23, 2011. Retrieved September 19, 2009. ^ "Perspective On The French-American Alliance". Xenophongroup.com. Retrieved September 19, 2009. ^ "Online Library: North Atlantic Treaty Organization". Nato.int. Archived from the original on September 13, 2008. Retrieved September 19, 2009. ^ United States Senate. "U.S. Senate: Washington's Farewell Address". ^ Avlon, John (2017). Washington's Farewell: The Founding Father's Warning to Future Generations. Simon and Schuster. p. 1. ^ "What We Can Learn From 'Washington's Farewell'". All Things Considered. National Public Radio. January 8, 2017. ——— (1996). "George Washington's Farewell Address". The Wilson Quarterly. 20 (4). Varg, Paul A. (1963). Foreign Policies of the Founding Fathers. Baltimore: Penguin Books.